No matter what weather, your kids deserve to have fun outdoors. If you worry about unwanted splish and splash, then getting the right pair of rain boots is the perfect solution. Cloudy and rainy skies should not keep your little adventurer from having a well-deserved fun. 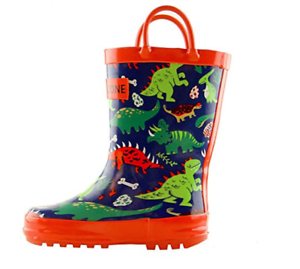 In this post, we’ll give you a run through and picked designs of the best and most fun-looking toddler rain boots for your kids. Buy a pair for them, and they’ll be happiest and cutest puddle-jumper in town! These toddler rain boots won’t only make them look a lot cuter than they already are, they will also keep your kids’ happy feet nice and dry. 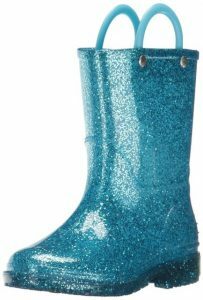 The rain boots that you pick should also suit your child’s taste. There are a lot of designs available, those with prints, plain color or bold and bright colors. It is important that the toddler rain boots you get will have an appeal to them. You would not want to spend on something that your kids will never wear because they hate the color or they don’t love the prints. Toddler rain boots should always be comfortable and well-insulated. These boots will be worn by your kids when walking, running, and even jumping. That is why you have to make sure that they are comfortable to wear one with soft insoles. 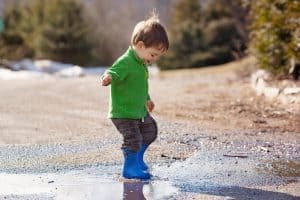 You don’t want your children to tell you that they’ll want to take their shoes off and just walk barefoot around puddles. Choose boots that will be able to provide enough support to the ankle and foot. It is important that you get your kids feet measured for the exact and correct size. 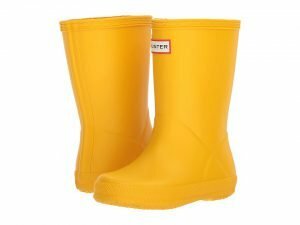 Unlike sneakers that should provide a snug fit, the rain boots should have a space of about the width of one finger, between the tip of the toes to the tip of the shoe. This is because rain boots are typically worn on during cold weather. And you will need to wear thick socks or even layers of them to stay warm. The perfect toddler rain boot fit should not be too snug or too large. Your child must be comfortable walking in them even when wearing socks or having orthopedic insoles. You should also note that if your kids keep on tripping or walking out of their rain boots, it means you got them the size that is a bit too big for them. Your kids will wear their rain boots sure for more than once a week; they might even wear them the whole day. 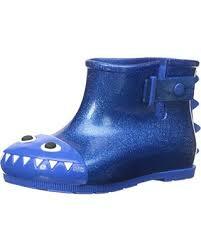 Since toddler rain boots get worn and worked a lot, it is necessary to get one that is very durable. Of course, rain boots are made to be worn out in the rain, wet, and cold, so they are made to withstand them. Choose rain boots that have sturdy handles that will not easily break with your child’s pulling. A durable boot will always make it out of your money’s worth since they get to be worn for a longer period. If you get lucky in picking a durable one, your first child might grow out of it, and it will still be good as new to be used by the younger sibling. Your cute little toddlers should not be struggling while wearing a rain boot on their own. 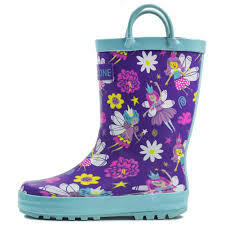 Mostly, toddler rain boots come with handles so they can easily pull them up on their own. If your kids are one of those who loves wearing clothes and shoes on their own, then you should find a toddler rain but with pull up handles or those that do not have too complicated closures and fastenings. If it is easy to wear, it should be easy to take off too. How can a rain boot do its job well if it isn’t waterproof? Rain boots are supposed to keep your kids’ feet nice and warm. They would not want a pair of wet socks, sticky feeling toes, and even smelly feet after they have trotted under the rain and jumped on puddles of water. Rain boots should not be stressful when it comes to cleaning. Most of the rain boots available on the market are easy to clean. You’ll just need to have a rag, small brush, and any soap solution. Just remember not to leave a dirty rain boot in the corner for too long since it will make the dirt more difficult to scrub off. 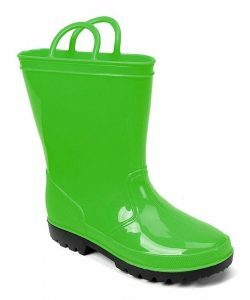 There may be instances that your toddler’s rain boots might get too dirty with caked mud, scuff marks, or white film. Caked mud can be easily cleaned just with soapy water, but if the mud does not still come off, you can mix baking soda with warm water and use it to wash off the caked-on mud. Scuff marks on boots can also be easily removed with an eraser or rubbing it with non-gel toothpaste. White film, which normally surfaces because of humidity, can easily be removed by wiping the boots clean and applying a drop or two of olive oil and wipe it with a dry cloth. In drying, you can just air dry the boots or put crumpled paper inside to absorb wetness. Never sun-dry the boots as the heat can damage the rubber and may cause deformity or change in color. 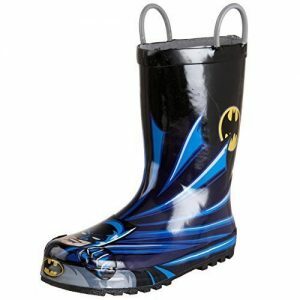 These cool-looking rain boots come with simple handles and will be great for your little boys. 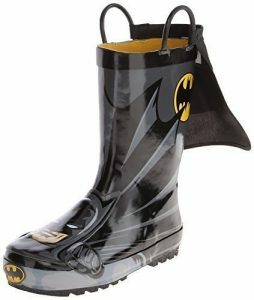 This is so that your little boys won’t have a difficult time while wearing these DC rain boots. They are made of rubber with grippy outsole to prevent slipping. The shaft of the boots measures approximately 6.5 inches from the arch; the boot opening is about 11 inches around. These rain boots have moisture absorbent cotton-lining and removable insole that are padded for comfort. Many parents love that these boots are super easy to get on and off. Parents are also pretty sure that these boots are super comfortable since their kids barely want to take them off. Another cool feature of this boot is that the Batman Dark Knight one has a mini cape on the boot for added superhero effect. It also comes in a Superman variant. 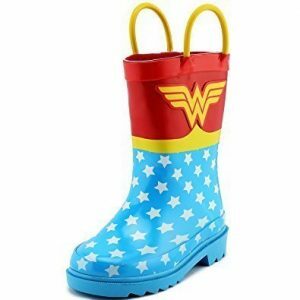 For the cute girls who loves being a superhero, this wonder woman inspired rain boots also adds a lot of superhero vibes while jumping on puddles. The design illustrated on the pair are of high-quality and doesn’t easily fade over time. It has a textured skid resistant sole, so you won’t have to worry about slips while running and jumping. It also comes with a handle for an easy pull when wearing and taking the boot off. The boots are also lightweight and super flexible so that your little girl can run and jump effortlessly. The non-insulated interior will allow your kids to wear these beyond just springtime. These are lightweight enough to wear in summer and fall without being too hot or making little feet cold. These Hunter Kids rain boots understand how kids feet grow pretty quick. The First Classic rain boot has a rounder foot shape design, with a wider opening and wide shaft, plus a flatter sole. All these combined features work well with your little kids’ growing feet. 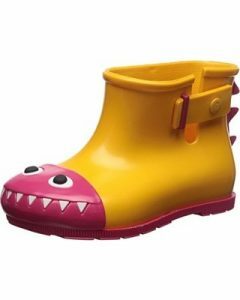 Thus allowing your toddler to get the most comfort and use of the rain boot as long as possible. Kids love that the insoles of these rain boots are super comfy and are available in many different colors. They are made with a soft woven nylon material that is comfortable to the feet. The boot’s shaft measures approximately 7.2 inches from the arch. One downside of these rain boots is that they don’t have handles to pull the boots on. Kids may have a hard time wearing these by themselves. However, with a lot of getting used to, they may be able to wear these boots on their own. The interior is also a bit spacious, so they don’t have to struggle in fitting their tiny feet inside. This pair of boots is always a great buy. 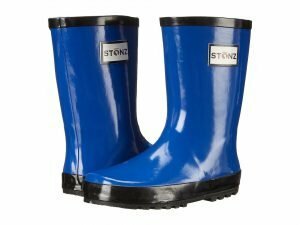 These rain boots from Stonz are made from all natural rubber that contains no harmful additives such as lead, phthalates, PVC, and cadmium. They are tear resistant and very durable. Despite its strong features, this pair is flexible and comfortable. Flexibility is super important especially for kids since they run and move a lot. Comfort is also a very significant thing to consider that is why it has a soft cotton lining to keep their tiny feet warm and dry. The cotton lining in these boots also dries easily. Your kids will also love that they get to choose from plenty of different bright and bold colors. But you don’t have to worry since the colors used in these are lead-free and the glue used is formaldehyde-free. 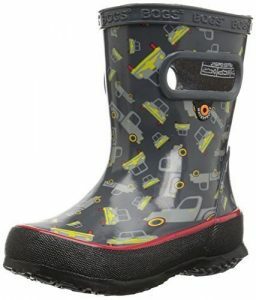 The Ska Doo toddler rain boots are made from super sturdy PVC material. They also come in many bright colors, so your kid has plenty of color options to choose from. Some parents say that although these colors are very bright, they do not look cheap and low-class. The handles of these boots are reliable and sturdy, and it helps your kids to wear it on their own. The soles of these boots are also non-slip, so your kids can run and skip on the wet ground safely. The only thing that parents don’t like about these boots is that they have a certain strong chemical scent, although most of them claim that the chemical odor fades over time. The Bogs brand is known and famous for their modern and sleek design. They are also very sturdy with compact and easy-to-grab side handles that ensure that they are durable and won’t break off. Despite the very durable material, these boots are not stiff and are very flexible. Kids love that these boots never hurt their feet even after long walks and even runs. 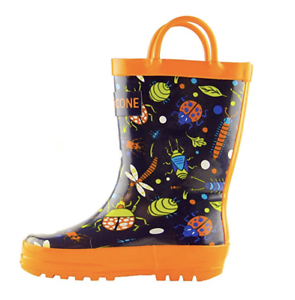 These Bogs Skipper toddler rain boots are 100% waterproof, with linings that have moisture-wicking material (Max-WickTM) to fight sweat and keep those little feet nice and dry. It has also contoured footbeds with DuraFresh technology to keep the boots and feet from nasty odors. There are a lot of patterns and colors that you and your kids may choose from. These boots, like all other Crocs shoes, are super lightweight and seamless. The Crocs Kids Handle It rain boots have handles that are thick and wide. These side handles are sturdy and very easy to pull up with so your kids will not have a hard time wearing these boots. Like any other Crocs, these boots are also very easy to clean. Despite the absence of lining, these boots are still very comfy and nice to wear. The outsoles are made with non-marking material to avoid marking up floors and walls. These boots also do not give off any foul or nasty smell. Parents should take note that these boots are a bit smaller compared to the usual sizing. 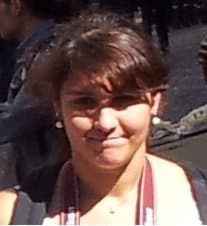 You may order one that is a size or two larger than their usual. These boots are perfect for sassy, chic, and glitter-loving girls. Rain, mud, and puddles should not stop your little kids from being all jolly and sparkly. 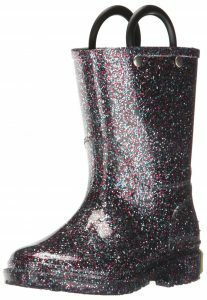 The Western Chief glitter boots also have handles so that your toddler can easily wear them on their own. They are waterproof with a trodden sole for improved grip and to avoid slips. The footbed of the boot is padded for comfort; the insoles are also removable. The linings inside are made of cotton and polyester. The glitters are inside the plastic so you won’t have to worry about glitters on your toddlers’ legs or all over the floor. Many parents complain of the strong smell that these boots have, but worry not since this smell will eventually fade over time and dissipates when you expose them to open air. When it comes to fab and fashion, these boots are on top. Most parents found these boots a lot cuter than they expected, and that must be a really good impression. 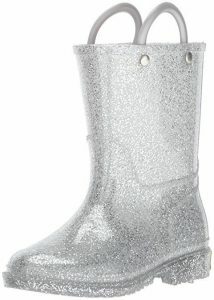 They also have a great and comfy fit since kids love wearing these glitter boots all day long! 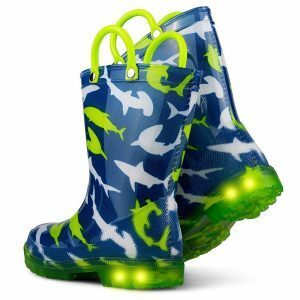 With these toddler rain boots, your kids will be able to lighten and brighten up any dark and grey weather. Kids will love how these boots have not two, but five lights! The side handles of these boots might not be the sturdiest, but they work. These boots are 100% and completely waterproof, so you don’t have to worry about the lights getting damaged because of the water and mud. Chillipop rain boots are specially designed with anti-slip and trod soles for extra safety and to keep them sturdy on their feet. These light up boots are available in may patterns that your kids can choose from. Lone Cone creates the most fun prints and vibrant colors you’ll ever see on rain boots. Their designs are unique and one of a kind since they collaborate with various artists to make the designs. That means you won’t find the Lone Cone designs anywhere else. Their designs will put a sparkle in your children’s eyes and boost their imagination as well. These boots also have handles which make them very easy to put on. 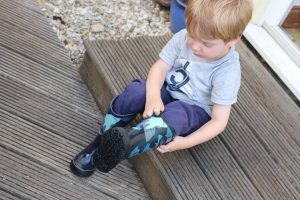 The boots are made from soft and flexible 100% waterproof rubber that let your toddlers be comfortable in walking, running, playing, and jumping. It is molded as a one-piece design to help in preventing split seams. The soles of these boots are equipped with non-slip traction for a steady foot and added safety. The interior is cotton-lined, non-insulated for breathability and added comfort. These boots are also super easy to clean. 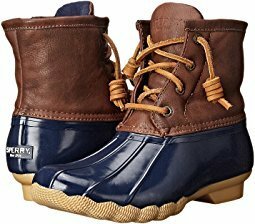 These Sperry rain boots are perfect for when your kids are in for a little dress-up. This features a classic and elegant design while still being able to meet up with all the puddle jumping sessions. It has rawhide lacing that ensures a secure fit. You don’t have to worry about the knots and ties since this boot has a zipper closure so that your kids will be able to easily put them on, and take them off as well. This Sperry boot has non-marking rubber lugged outsole with wave-siping for ultimate wet and dry traction. These versatile boots are also available in adult sizes so that parents can get a pair for them too. It can be a perfect matchy-matchy with the whole family! 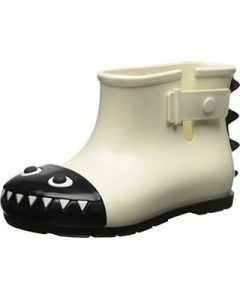 These cute mini rain boots by Melissa comes in a very attractive dinosaur-like design. It is made from 100% waterproof PVC and rubber sole. The shaft only measures approximately just ankle-high from the arch. The sole, like any other Melissa shoes, are very flexible and comfortable. Many parents find these boots adorable; kids love them too. So many children who own these boots hardly even take them off. They are super comfy and breathable, and they don’t easily slip. They are also super easy to wear because of their low-cut design. Breaking in the rain boots for your little one is very important. This is to make the new boots a bit more flexible and less hard for your kid. Bend the soles of the rain boots back and forth repeatedly. This will increase the flexibility of the material in the toe and heel area of the boot. You can do the bending for a couple of times every day, during the first weeks. Let your kids wear the rain boots out for a short period. In this way, your kids can get used to the feel of the boots. Let them wear it for a couple of minutes to an hour before taking them on long walks and adventures. You can even let them wear it inside the house while they are eating or playing. This is to avoid unwanted feet pains that can ruin a great adventure. You can ask them if they would still want you to bend the soles for them. Don’t forget to let your kids wear a good pair of socks. Make sure that the socks they are wearing are thick enough to protect their tiny feet. These socks will help the insides of the boot to conform to your kid’s foot shape and keep them comfortable while wearing the boot. It is also a great idea to keep the rain boots filled in even if the kids are not wearing them. You can crumple up a few pieces of paper or roll up an old magazine and place them on the insides of the boot, up to the toe area. This practice is also helpful to maintain the shape of the boots. It is also an effective way to prevent a folded or dented boot. A deformed boot will create discomfort around your toddler’s tiny foot. If you and your kids are planning to take long walks with a new boot, put bandages on the areas of their feet that may be prone to chafing and blisters. The heel and toes area, specifically the pinky toe, should be paid attention to since they tend to get easily chafed. Kids will always love playing in the rain and jumping in puddles, even wading on streams. 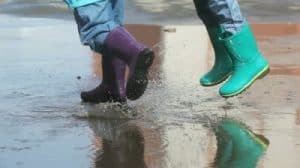 And, we all know how soggy and wet socks can make us feel uncomfortable, that is why we should not let our kids get the icky and sticky feeling wet feet can give. Rain boots also serve as protection for our little ones so that they can avoid getting cold and frozen toes. Getting your kids’ feet constantly wet can also lead to various skin problems and fungal infections, that is why we need to get them the perfect pair of rain boots not only for fashion and style but also for function and protection. 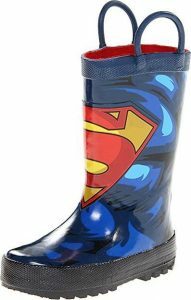 Providing them an awesome pair of rain boots will also give them the freedom to run and play in the rain, mud, or any wet surface safely. There is nothing more heartwarming than seeing your children enjoy pure fun under the sun and even the rain!